Another television news team has drawn attention to the use of aftermarket parts by auto insurers for collision repairs in a very thorough new report. Rachel Polansky, reporter for the Syracuse, N.Y., TV station, describes a familiar situation — a policyholder who didn’t notice the fine print allowing non-OEM parts and the pressure insurers place on repairers to use them. 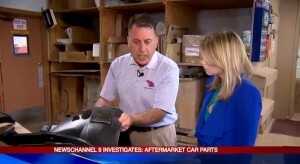 “In most cases, there is no negotiation,” Jeff Lyman, owner of Jeffrey’s Auto Body, says on the broadcast. This time, the car was Michele Bassett’s 2012 Volkswagen Jetta — barely three model years old — upon which an unspecified insurer wanted to place an aftermarket light and fender liner, according to WSYR. Bassett took the Jetta to Nick Orso’s Body Shop, where owner Mike Orso told her about the nature of the parts and said they wouldn’t fit correctly, according to the station. Bassett’s insurer ultimately listened to Orso and allowed the parts, according to WSYR. Bassett told the station she still might switch insurers. Polansky does erroneously imply there is no benefit to repairers in using OEM parts over non-OEM ones other than being able to look at oneself in a mirror — missing the fact that there is typically a markup to the insurance company. But the rest of the report is very comprehensive, touching on the concepts of wasted time getting non-OEM parts to fit, the importance of repairing something the way its manufacturer says, and even soliciting input from General Motors and Toyota. Polansky also interviews Republican state Sen. John DeFrancisco, who this session introduced Senate Bill 30. That bill mandates collision repair shops (and insurers) use original equipment manufacturer parts for the first three years of a car’s life or the length of a relevant warranty — whichever is longer. It also requires them to tell customers what replacement parts they used after that time and get customer approval to do so. Insurers would also be responsible for the extra labor costs required to install a non-OEM part if it’s not the easiest fit. By the way, though OEM parts do cost more, the Property Casualty Insurers Association of America estimated in 2013 (using 2009 NAIC data) that dropping aftermarket components would increase premiums by $24 a year. We hope you haven’t been buying too many mansions with the money you saved. State Farm and Allstate sent the station to the Insurance Information Institute, and spokesman Michael Barry told WSYR that parts are inspected by the Certified Automobile Parts Association, which still isn’t accurate for many parts. Strangely, the III highlighted the predominantly anti-insurer report, posting a complete copy on YouTube and pointing to it on Twitter.